Last night Amazon’s new Fire HD 6” arrived on my doorstep. Here are my first impressions of the new budget tablet. I will direct you to Amazon’s main Kindle page to get the full specs. The 6” format is darned cute and practical. 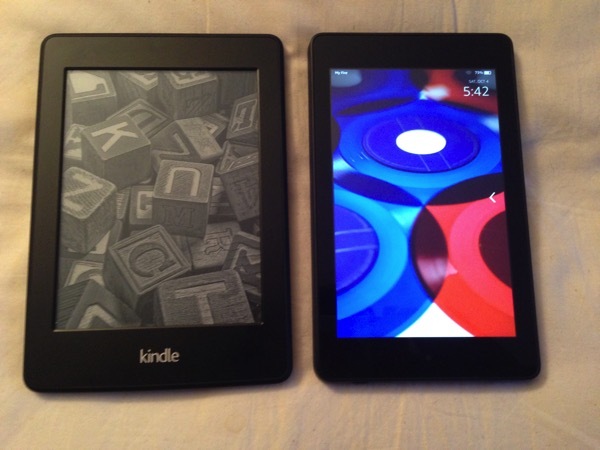 Here are some pictures comparing it to the Fire HDX and Kindle Paperwhite. The format is going to be very practical for sticking in a handbag or pocket to take around. 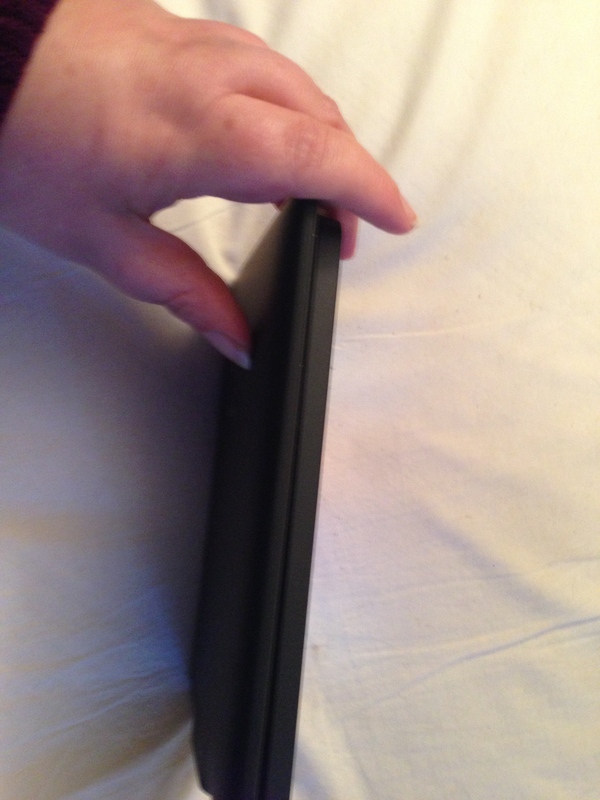 It is blockier than the Fire HDX or Paperwhite – no tapered edges but it is very compact. 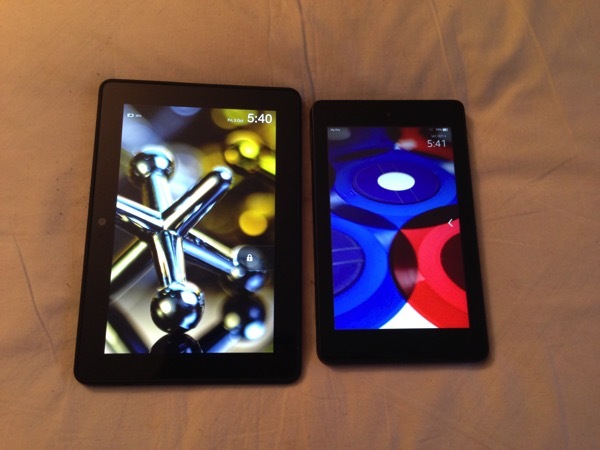 In terms of weight though, there is very little difference between the 6” HD and the 7” HDX – a mere 0.6 of an ounce. The Fire HD 6” comes with the new Fire OS 4 Sangria, which will be sent as a free update to existing Fire devices according to the note on my Fire HDX this morning. There are some really neat features to Sangria. A backup feature worked well. This will allow you to restore your device to a previous state if there are any issues. The new About the Book feature which you can setup to open as you read the book could be very useful. It tells you brief information at a glance – author, number of books in the series, order in the series etc. GoodReads is more tightly integrated with your being able to add the book to your Want to Read/Currently Reading/Read shelf from within the book. Nice. It will still be even better when they allow you to access your own shelves from within there. The Fire HD 6” is a budget device as you might expect from the price. 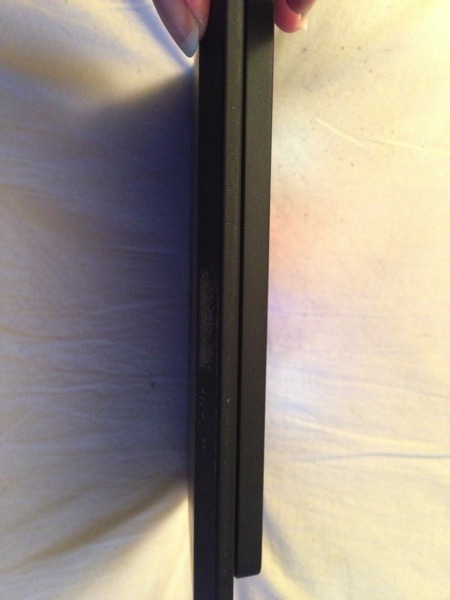 It has single band WiFi compared to the HDX’s dual band. it has mono speakers – forget about listening to the device without headphones. Its processor is Quad Core up to 1.5GHz rather than the HDX’s 2.2 GHz. It also comes with 8GB or 16GB of storage which is not great if you want to store content on the device rather than rely on Amazon’s Cloud. My requirements for a Kindle tablet are pretty basic. I need to be able to read my Kindle books, listen to my audiobooks, pick up my email, some basic web surfing, play the odd game. When I was checking it out last night, I really felt it was struggling to meet those basic requirements. I found the device to be at times unresponsive, with multiple taps being necessary to do something. Browsing on Silk was painful. It’s never been great at the best of times – often I will reach for my iPhone and use Safari on the small screen rather than deal with Silk – but last night it was particularly laggy. Typing on the device was slower than on my Paperwhite. However, I found this morning that it was much more responsive. Maybe the device was doing some update in the background. I will try using it as my main tablet for the next week or so to see how it performs. That being said, it would be unwise to expect iPad like performance from a tablet costing $134. Fire OS 4 Sangria is very new. While there are a few great new features, I have found my experience with it to be rather buggy. The registration process when I first opened the device threw up errors. It subsequently went through, but it was worrying. I found the GoodRead apps crashing forcing a restart of the device. I also found I couldn’t get Immersion reading to work. For me that is a real deal breaker. The issue is now with third level support at Amazon/Audible. Although I have not had an altogether positive experience with the device so far, I do feel it has potential as a budget tablet if you set your expectations accordingly and wait a couple of weeks for Amazon to get the kinks worked out.